Above artwork credited to Simon Hodges a brilliant artist who you should all check out. @IanLevine I have a possible lead on missing DW and Goon tapes. How can I contact you? Above: Andy’s Original Tweet to Ian Levine. Hi Andy, thank you for agreeing to talk to me. First off, how did you find out about this collection of episodes? I have a Facebook friend who is a broadcaster in Taiwan – he’s originally from the west but has lived in China for over a decade. He’s also a radio and TV enthusiast and has a large collection of broadcast tapes and films and off air recordings, most of which are in storage, which he’s picked up or purchased over the years from various stations he’s been at, record shops etc. About a year ago he mentioned that he had over 200 Goon Show episodes and that he thought he might have some that the BBC had lost. I asked him if by any chance he had any missing Doctor Who’s. He said he had a few Doctor Who 16 mm reels but he didn’t know what year they were from. I sent him some info about the search for missing Doctor Who episodes but I’m afraid I wasn’t able to catch his interest and I dropped the matter until a few months ago when news of the discoveries in Nigeria broke. I posted a link on his wall about it and asked him about the Doctor Who reels. He’s quite busy with his work and wasn’t interested enough to go back to his storage unit and dig through the tapes so I thought the best thing to do was to try to put him in contact with someone who’d be better able to persuade him to take time out of his busy schedule in order to look for what to him were just reels of a decades old children’s show. Since my Facebook friend produces several music programmes and seemed interested in 70s and 80s music I thought Ian Levine would be better able to establish a rapport with him (and might be someone my friend would want to interview for his show) and so might be able to convince him to go to the trouble of sorting through his storage locker. So I contacted Ian over Twitter. He was very enthusiastic, though wary since I think he’d been burned in the past – he had me contact Paul Vanezis as well and then I put both of them in contact with my friend in Taiwan by cc’ing them all in a Facebook message. After an initial exchange of introductions I dropped out of the picture and left it to Ian and Paul. Where exactly did this collection of episodes originate from? The US Armed Forces operate a network of radio and TV stations (Armed Forces Radio Television Service or AFRTS) to serve US military personnel. One of these stations was AFRTS Taiwan which was decommissioned in 1979 after US troops left the island, as a result of the US establishing diplomatic relations with Beijing. The station’s broadcast archives were left behind and, a few years ago, our friend in Taiwan found a cache of AFRTS tapes, film reels and records – I believe in a used record store though I could be wrong about that – and bought them up and put them in storage and from time to time he’s been sorting through and digitizing a few recordings for use on his own broadcasts. How did you feel when you heard about the episodes that had been recovered? Well I was quite happy. In the initial exchange of FB messages that I had been included in, my friend said he recalled having 8 reels that were originally in cans that were only labelled “Dr. Who” and the year – he thought 1963 or 1964. Since as far as all the missing episode “scholarship” online was concerned no Doctor Who episodes had been aired in Taiwan in the 1960s I thought it was more likely they were reels of one of Peter Cushing films. I think the find is very exciting because even though they are not lost episodes their existence gives us the new information that Troughton episodes, at least from Season 6, were aired in Taiwan which suggests some of the missing episodes from that season at least, perhaps from earlier years as well, may be on the island somewhere – perhaps at the back of a used book or record shop or in boxes someone has in their closet or attic or elsewhere. Also, the fact that the TV station disbanded in 1979 and yet our friend was able to find and buy part of its archive 30 or so years later also suggests more of the archive may still exist. Finally, if his memory is correct and he had 8 reels in the lot of material he bought that means he still has 3 episodes of unknown vintage in his storage locker some or all of which may be missing episodes. In what way do you think that the discovery of this set of tapes will affect the claims that Phil Morris has discovered more episodes that have yet to be released? I don’t see how it would have any effect. They’re independent discoveries. Hopefully, if the BBC has any discoveries that they haven’t announced they will recognize that more excitement will be generated if they are transparent about what’s been found rather than keep things embargoed for marketing purposes but personally, I see no evidence that the BBC hasn’t been forthright about what they have in hand. On the other hand, if Phil Morris or the BBC know about new discoveries but haven’t actually completed the process of acquiring the films it would be perfectly understandable why no announcements would have been made as they’d be premature and possibly compromise the process. What do you think will be the ultimate fate of the rediscovered tapes? Returned to the BBC Archive presumably? I don’t know, I believe Paul (Vanezis) is working on that angle. I assume they will be viewed and if they are in any way superior to the BBC’s copies then duplicates will be made. Do you think this discovery will affect Taiwan? Will we soon see more and more episodes hunters going out to Taiwan than say Ethiopia or Nigeria? The discovery and the fact that a collector in Taiwan was able to purchase boxes of archives decades after AFRTS Taiwan disbanded suggests there may be more Doctor Who reels either in a used book or record store, at a radio or TV station that acquired some AFRTS archives in bulk or in the hands of a private collector and, moreover, that someone may not even know what they have or that it is being hotly sought. If there was publicity in the Taiwan media about this then perhaps someone who acquired a box of tapes and films years ago will be motivated to look through them to see what they have? Andy suggested that “if AFRTS Taiwan aired Doctor Who episodes unbeknownst to the BBC perhaps other stations in the network did as well?” Deciding that this was a lead which should be explored further I opted to see if I could find any further information from people who were actually at AFRTS Taiwan during that period. And I found one, a man called Burt Schneider who was the officer-in-charge of the Armed Forces Network in Taiwan from 1967 until 1969. Burt ran a blog named Armed Forces Radio (A link of anyone interested is here http://armedforcesradio.blogspot.co.uk/) but he hadn’t posted since August 2012 so my expectations of him getting back to me weren’t high. I sent messages out to him and others who were involved in the Armed Forces Radio And Television Network during the 1960s and at first got no reply. A few days past and I began to wonder whether they would. A copy of The Moonbase. The tapes found in Taiwan were similar to this. I suddenly realised something at this point: Nobody seemed to know where exactly the episodes had come from. Yes they had been owned by the US military but how had they got their hands on them? At this point I was not in contact with either Ian Levine or Paul Vanezis so I decided to see if I could try and guess myself. The first, most logical thought was that the episodes had come from Hong Kong, simply because it was the nearest known location that had been sold episodes in the 60s. However, Hong Kong never bought any of the episodes that had been mentioned. I decided to spring the net wider. Singapore seemed the next logical step but again they had apparently not bought the episodes that had been mentioned. I came to the conclusion that the only logical place these episodes could have come from was Australia. The episodes that had been found were The Dominators episode two and three, The Seeds of Death episode two and The War Games episode one and two. Australia had bought all of these stories in the years 1969 – 1970. Seeing as the Armed Forces Network Radio Television station in Taiwan shut down in 1979 it meant that these episodes must had been broadcast in Taiwan sometime between 1970 and 1979. But how did the US Army get their hands on these Australian episodes? The BBC had never sold episodes to Taiwan let alone the US Army. The only way that they could have got their hands of them is through the same method that the Web and Enemy episodes arrived in Nigeria. This happened through the cycling system where tapes were sent from one station to another until ending up in the place where they are rediscovered years later. If the tapes had been sent to Taiwan between 1970 and 1979 then Burt and his co workers would probably have no idea about these particular Doctor Who tapes as they had been demobbed in the late 60s. I realised that even is Burt got in touch then it would be useless. The trail seemed to have gone cold. Since then it has stayed cold. Hopefully the people who are out in Taiwan will turn up some new leads but at the moment that is all that the Taiwan collection is. A lead. However I do believe that some episodes exists out in Taiwan, whether they are missing episodes or not only time will tell. I’d like to thank Andy Lehrer and Ian Levine for their cooperation. 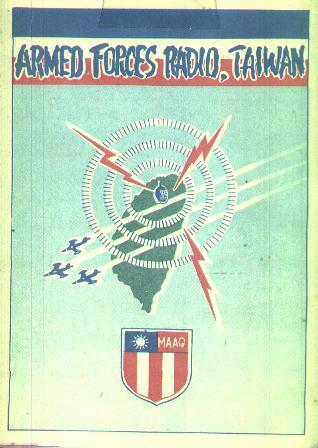 If anyone who worked at the Armed Forces Radio Television Station in Taiwan remembers anything in regards to BBC content that was broadcast by the station then please get in contact with either Paul Vanezis or Phil Morris. Update: Eric Loveman who worked for AFNT Taiwan has told me quite plainly that ” AFNT was just radio”. 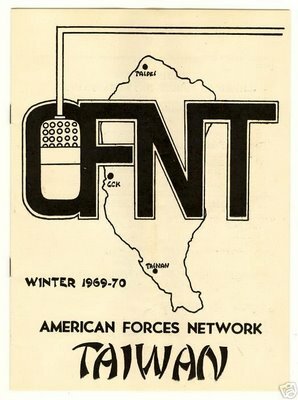 Eric worked at AFNT from Nov. 1966 to Feb. 1968 then again October 1969 to October 1971 and finally in the fall of 1979 when AFNT was taken over by the government. They wanted a TV station but “The speculation was that the local government didn’t want us competing with the two local TV stations”. So either the episode somehow magically appeared in Taiwan or they were sent to one of the government TV stations. Update of an update: I’ve been in contact with a guy via The Cult Den, who says that in 1984 he spoke to a US Sergeant who said that just after the end of the Vietnam War he was out in Asia (the guy can’t remember where exactly but he did spend time in Taiwan, South Korea and Japan ) and this fellow said that when he was out in Asia he saw black and white Doctor Who episodes. He didn’t remember much but just that they featured the Daleks and “the guy who looked like Moe” (of the Three Stooges). Apparently the guy who looked like Moe was Patrick Troughton. 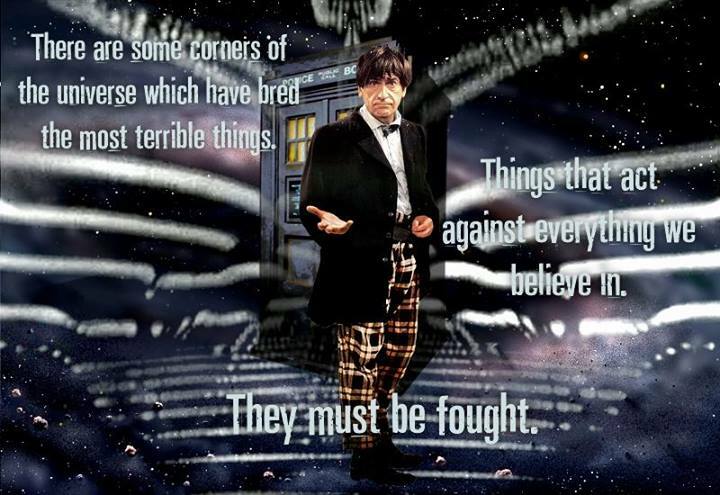 Could either Power of The Daleks or Evil of The Daleks be somewhere in Asia? I hope to find out. Correction to your article: Australian prints, including the stories in question, were conclusively sent back to the BBC in London on June 4th 1975. 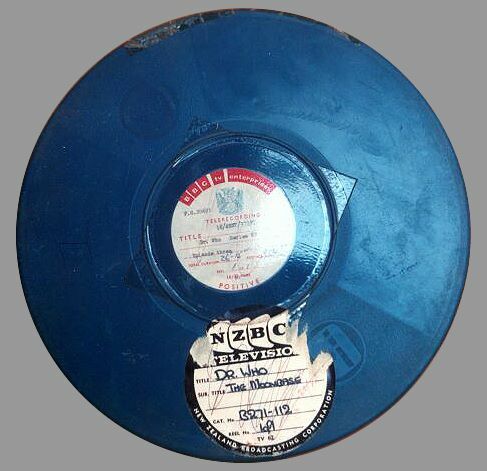 In fact, Australian’s copy of The Dominators was found in 1978 when BBC started their search for lost material. Also, Singapore did purchase the three stories in question. They broadcasted Dominators In November of 1970, Seeds of Death in April of 1971, and War Games in July of that same year. They likely received their prints once Hong Kong had finished broadcasting them earlier. Thanks for your comment. I’m not the biggest expert on missing episodes and the information that I got from old DWM’s seemed to point to Australia. If what you say is correct then I guess they must have come from there which would have made more sense than Australia as Singapore is nearer to Taiwan. You’re welcome. We’ve been discussing the possibilities at great lengths over at the Missing Episodes Forum. Singapore so far is the #1 guess, but we’re still confused as to how this all occurred. Thank you for the article though. It’s great to see something other than the “omni-rumor” get the spotlight for a change. 🙂 And this discovery is very important! You can visit BroaDWCast to view more information about known broadcastings across the world of individual titles. I had assumed that there was an AFRTS TV station in Taiwan since the collector, and then Ian on Twitter , said the material was sent to AFN TV but one person on the Missing Episodes Forum is saying there was only an AFRTS radio station in Taiwan indeed, the info about AFN Taiwan on the internet only refers to radio so if you’re in contact with someone who was with the station it would be good to establish if they ever had a TV station or handled TV programmes. If not, we’re left with a mystery. Since it was several decades between AFN Taiwan’s archives being decommissioned and the collector in Taiwan acquiring part of them it’s quite possible that the lot he purchased had been mixed with other material over the years so that he would assume they came from AFN when they came from somewhere else. Or perhaps they came from another AFN station and were sent to Taiwan accidentally? Hopefully this can be figured out. I’m hoping to establish this when he gets back to me but in his first email he did mention syndicated programs at least this proves that they did broadcast drama and comedy content which I haven’t seen mentioned elsewhere. He doesn’t remember any BBC content but then he was on the news side as opposed to the syndicated program side but he is in contact with most of his old pals who were there so they will probably be able to give more info in regards to that side. What about the Goon Show element? Has anything new been recovered? Can anyone give details please? I don’t know what is happening in regards to The Goon Show episodes. Hopefully Paul will be sorting those tapes out and sending them back to the BBC. Paul will hopefully check that out but it’s likely there’s some confusion between transcriptions – episodes which had topical references and some risque material edited out before being sold overseas and which the BBC still has and the original UK broadcast episodes, some of which have been lost. Since the lost versions were not sent overseas it’s far less likely they’d turn up overseas unless they were taken abroad by a British collector (or picked up by a collector visiting the UK). Hopefully, Paul will have a chance to check out what the Taiwan collector has, just in case, but when we talked about it initially we thought it was far less likely the material would actually be missing. Ian’s reporting 5 more finds on his Twitter and FB account, none missing unfortunately. Hopefully, further investigation will give point to more finds eventually.